Where did all the time go? Oh, yes…Facebook! Yes, if truth be told, I am addicted to Facebook and a wonderful group of friends with whom I chat every day! I tried many games and have settled on a couple of them. Not accepting ANY more invites!!! But I promised myself that I will “pull-it-together” and update my sites. I have a painting sitting on my easel. It is looking over my shoulder as I type and calling to me. Perhaps after the Christmas holidays I will get that delightful mineral oil scent going again and push around the oils…. 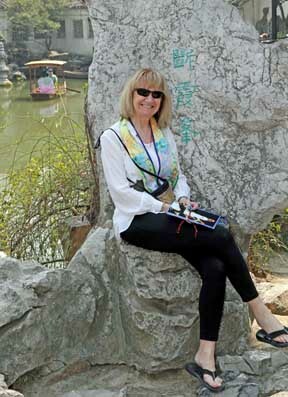 A quick update: I went to China in March 2011 for ten days! My French friends from Montlucon came to see ME this summer and we took them to Yellowstone. I am making jewelry now and still playing around with my yarns, as well as spending lots of time with my Photoshop program. My family is fine and my granddaughter is now 6 yrs old. She is going to be an artist, a gymnast or maybe a rock star when she grows up! And the BIG NEWS: I will be retiring from my teaching career this summer! I am very excited and looking forward to more travel and creative time! ~ by chezchristineo on December 5, 2011. Oh this is spectacular! I hope you continue to do the things you love! Progress! No more FB games, doing at least a painting every month and selling a few. In 2013 I spent two weeks in Italy, a week in NW France, and two weeks in Paris. I am reading more, relaxing more, cooking better food, and spending more time with family and friends. Retirement is grand!